Other than the link in the comments, users that answer are not directed in any prominent way to the dupe target and often prefer to just continue and answer. Could users that answer be given a duplicate preview before they answer when a close vote exists? The implementation could use the same logic and UI as adding a second answer to a question: answer box is hidden behind a button saying "Add Another Answer" which pops up a confirmation dialog before allowing any typing. It would require some logic around if you start posting an answer before the close vote comes in, but for users that navigate to the page after the close vote, they could be shown any dupe targets before they can answer. This wouldn't prevent answers and I don't think one dialog and click is too much of a barrier to answering in the situation where a vote exists. You need 15 rep to flag and 3K to actually VTC, which would have to be accounted for. Both relate to posting duplicates as answers, as opposed to showing them in a dialog to people that are about to answer, in the same way users that close vote see existing close targets. 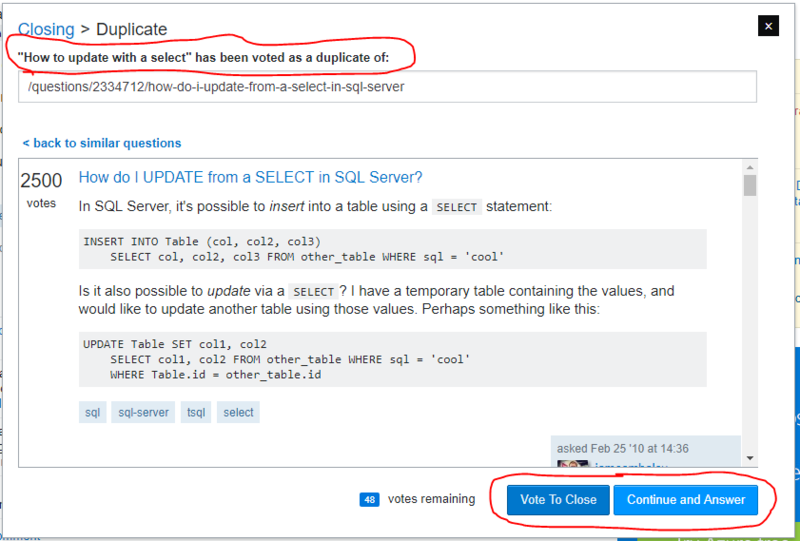 Browse other questions tagged feature-request duplicate-questions vote-to-close .